(Lakota language exercises are at the bottom of page). I have gained fluency in two of the most difficult languages as an adult and I think that the Foreign Service Institute (FSI) type courses, Barron’s Mastering Series were the reason for my proficiency. The Barron’s Mastering Series is available used on Amazon or Barnes and Noble, (I recommend the CD versions) for Spanish, German, and French at discount prices. This is the best template for teaching a language. The FSI program is the product of millions of dollars spent by the U.S. government to develop the best foreign language training program. I have over 50 books on learning the languages that I have learned. Some of these books are good and some are bad. However, the best by far are the FSI style books. After using them I gained automatic control over syntax, vocabulary, and verb conjugation in these languages, (Japanese and Korean). In fact, my job is connected to my ability in foreign languages, we handle documents in over 17 languages daily. In short I have internalized the grammar and vocabulary of Japanese and Korean. Hold on, what do these languages have to do with Native languages? Learning a new language is the same for all people. Japanese and Korean are some of the most difficult languages to learn for students. I am showing the best materials on the market. They can be adapted for a Native language course. If this same method is applied to learning a Native language, fluency will dramatically increase. My hope is that commercially viable language learning techniques are used by teachers of Native languages, and soon. I mastered languages less by study and more by repetition of correct sentences, or over-learning. Later on, by living in these respective countries with complete immersion in the language, and continued study, I mastered these languages. From the moment I arrived in these countries I was conversant with native speakers because of the FSI courses. I think what I have learned could help you create a better Lakota second-language acquisition course, (for teens and adults). However, let me point out that I am not aware of the unique challenges that you might face in creating this course. I will also illustrate some general concepts about learning, cognitive psychology, and tie them all to my suggestions for how to improve this course. It should be no surprise that the FSI method closely the natural human way of learning language. Native and otherwise. All this R&D to find out what your ancestors already knew. Many of the FSI courses are in the public domain. You can review any of 50 foreign language courses with audio and text for free on the Live Lingua site. (Click ‘Read Online” after selecting a language). Native American languages are unique to this continent. They grant access to rich cultural traditions. They also serve as a way to connect with others in the tribe, they give children direct access to the knowledge of their grandparents, provide a unique view on the world, and creates cultural continuity from time immemorial to the present. Also, for many young Lakota, the Lakota language acts as a bulwark against the feeling of being lost in mainstream culture. It acts like an anchor when young Lakota people experience cultural dissonance, (between the two cultures) by giving them a strong sense of identity and connection. Negative aspects of mainstream culture like sports team mascots and other things can cause damage to Native people. I think and a strong sense identity created by mastering a Native language can counter some of these negative effects. Also, if a young Native person has a strong identity, it can keep them gravitated towards the tribe and keep them strong during a journey to distant places. I think most of the content in the course is interesting, useful, and appropriate. However, I have some suggestions based on the discrepancies between how I learned and what I see in this course. First off, I think that there is too much English on the CDs and not enough Lakota, there are no model conversations, there is not enough information about appropriate usage, and the organization of the material could be more strategically presented. Now I will explain some concepts that will serve as the foundation of my suggestions. Once I have illustrated these ideas, I will make more specific critiques and suggestions on the content with examples. Here is a flowchart of FSI lesson material. You can print it for review, (11″ x 17″ is recommended). Learned helplessness is giving up. In the context of learning it is when you feel that you are overwhelmed by something, it is too difficult for you, you are frustrated, you hit a wall and give up. More specifically it is a mismatch between a problem and your skill set to deal deal with it. 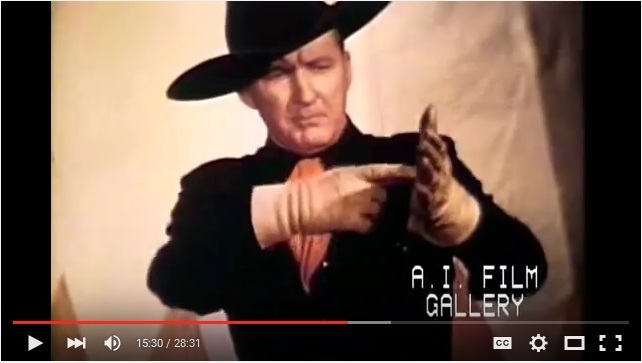 Plains Indian Sign Language for Give Up, the index finger hits a hard object and falls away. -Interpreted by Col. Tim McCoy. However, the worst thing that language learners face is learning incorrect words and phrases, (e.g. Aŋpétu wašté). This is because the student must unlearn the word or phrase, then learn the correct one, it is very discouraging. Boredom occurs when we have too much control or everything is predictable and we don’t feel challenged. Flow is when our skill set and the problem are well matched. We feel confidence in our own skilled effort. We overcome the next challenge and feel a sense of accomplishment. I found a good example of Flow in Units 4 and 5. The student is given exercises to practice in Unit 4, the meaning is clear, and then you take off the training wheels, then in Unit 5 there is only Lakota, (I wish the rest of the CD was more like Units 4 and 5). This Flow concept is at the core of my criticism. My suggestion is that you should not be concerned with teaching Lakota alone, but you should be concerned with having students experience flow as much as possible, or confidence in their own skilled effort… feeling that they are challenged but can succeed in the target language without English. Put another way, you nurture the motivation of the student to learn by strategically presenting the material so it seems easy. Sounds impossible right? I beg to differ. This strategic presentation gives the student a feeling of confidence in their own ability to learn and gain control of the language. The FSI method which is based on model conversations, with accompanying grammatical notes and drills all in the target language only from the fist day offers this to students. At the end of the course they have reflexive control of the target language. The student should ultimately have control over the language in a Lakota only language situation. towards the end of the lecture. Another aspect to Flow was described by Jonathan Haidt when he showed how the mind works while driving in his book, The Happiness Hypothesis. The unconscious mind and the conscious mind can work together beautifully. For example, while driving. The learned behavior of how to drive is handled by the unconscious and the conscious mind is free to multitask. The conscious mind is free to listen to the radio and survey the road… Oh look at that sunset! Also, when a truck swerves too close, the unconscious is ready to react and before the conscious mind can think about it you already out of danger. In the context of language, Flow would be having a conversation in the target language but not being consciously worried about syntax, grammar, vocabulary, verb conjugation, or the ablaut before šni. Rather your conscious mind in concerned with deciding what you want to say, not the mechanics of how to say it. I believe this is most easily achieved for adult learners by model conversations and strategically planned language drills. Also, as the learned language skills become part of the unconscious it will react to situations before your conscious mind has time to think. Oháŋ! Unit 9 teaches, Wóphila. The student practices saying Wóphila. Then, the next phrase is Wóphila héčha and so on. This unit maximizes the students effort by building each phrase on the students previously practiced word and phrase. The student feels that they are progressing well with minimum effort. They feel that things are getting better, I am getting better at this language. This is very helpful to learners, encouraging further study. By breaking up long sentences for the student, you make them feel confident, not overwhelmed. Here is the key to good presentation; maximum results for the learner that require minimum effort. 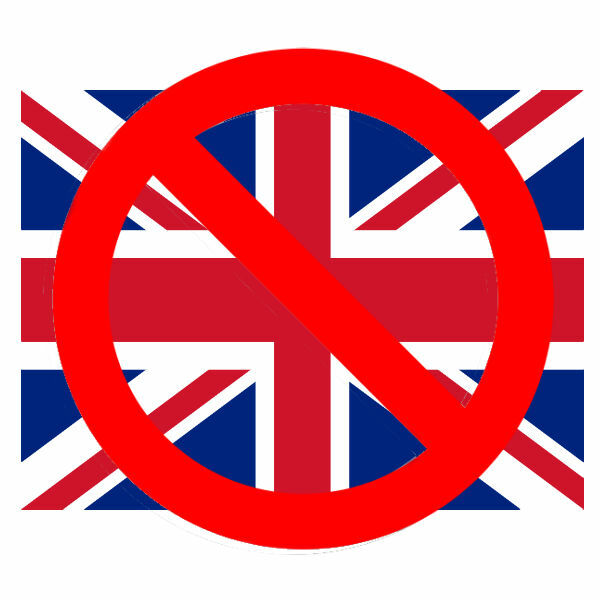 There are approximately 400 million non-native speakers of English. Part of the reason for this number of speakers is Ogden’s Basic English program. It took word frequency studies and distilled English down to 850 primary words. If you think about it makes sense because if most of the words we use everyday are at the top of this word frequency pyramid, (e.g. I, she, go, come, under, on, eat, drink, sleep, book, table, bed). Then words that we use less frequently will be lower on the pyramid, (tractor, diagnosis, rebate) and we can start to see how English could be condensed down to 850 words. Until you get to the bottom where there are only specialized words for certain professions, (e.g. ancillary reagent, resource holding potential, fixed action pattern). Most English speakers don’t know or care about the words at the bottom of this word frequency pyramid, (which is a large part of the language). However, if you work in medicine, biology, or ethology these words are at the top of the pyramid for you. Therefore, I think that in order to promote the Lakota language the top of the word frequency pyramid is where it is at, or the most frequently used 850 words. Most people want to communicate in a daily usage sort of way, “Hey Tina” “Yes dear?” “Can you make some frybread with wojapi?” “Um, I’m busy dear, make it yourself.” Everybody likes food, and they like to talk about food. Or how about, “Where’s the bathroom?” By verifying that a word or phrase is actually something you can use in daily life is a great way to get people to use your language material. The FSI program does a great job of this. Almost every word and phrase is useful in daily life. So they teach syntax, grammar, and vocabulary via repetition of useful words and phrases and not the other way around. I would like to see 200,000 Lakota, Dakota, and Nakota speakers. Basic Lakota anyone? Martin Seligman taught that the opposite of learned helplessness is confidence in our own skilled effort. As applied to language learning I think this would be teaching what needs to be taught and then encouraging the student to exercise their knowledge, building their confidence. This way they learn that their locus of control is internal, they know that they can gain control over the language. Again, I think Unit 4 and 5 do this well. In Unit 5, the student is left to fend for themselves in a Lakota only question and answer situation. My general suggestion for the course is I think there needs to be a more robust text book with a FSI style presentation. 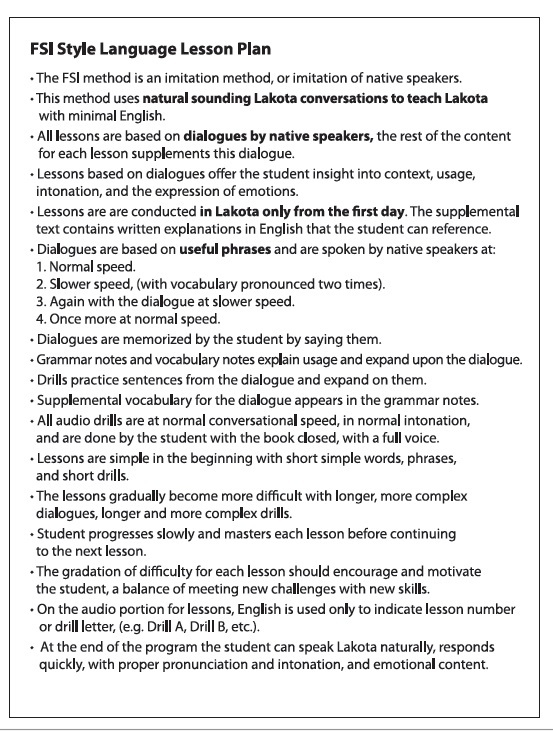 Also, I suggest that the audio portion be only in Lakota (with minimal English), with dialogues and drills at normal conversational speed. Again, you need train students to be able to fend for themselves in a Lakota only environment. What is language? Is it the mechanics of producing the sounds or is it about the underlying structure? My personal opinion is that language is more about the latter. According to Dr. Robert Sapolsky, (see video below) our brains are designed for conversations. Language is a collection of conversations and not a collection of words and phrases…. language is a collection of exchanges, (signal and feedback). 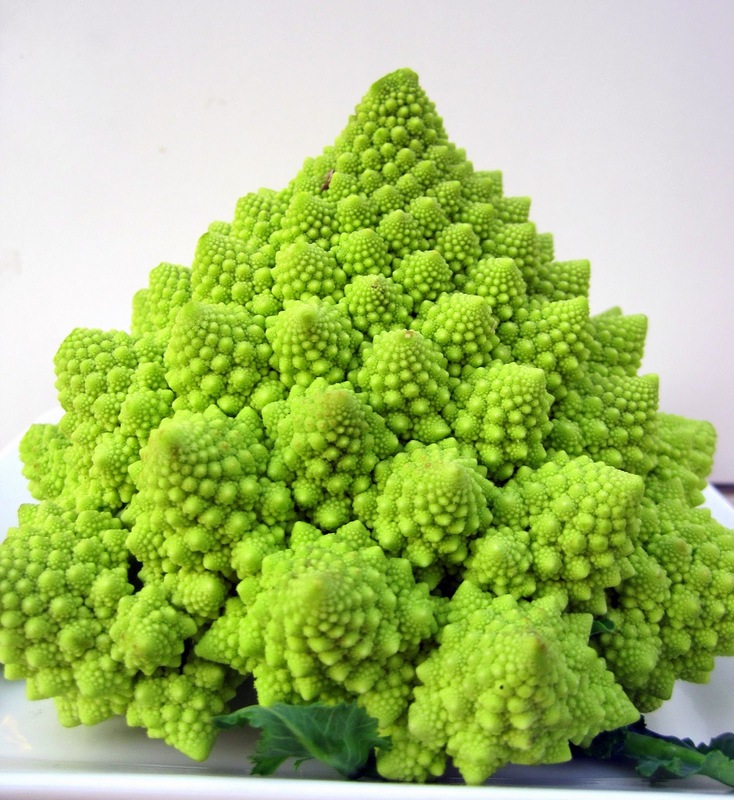 Much like the self-similarity of a Romanesco cauliflower, how each floret is a miniature of the whole cauliflower, each conversation reflects the underlying structure of the whole language, (of course not all the syntax and vocabulary are in each conversation). Structurally, the a language and a conversation in that language are one and the same. Dialogues are a microcosm of a language, conversations beget conversations, and conversation is the ultimate goal of a language learner. Why not dive right in from the start? When you learn language with the FSI method each lesson begins with a model conversations. The social aspect of language is emphasized, the method can basically be described as conversation and listening comprehension exercises. The conversations in each lesson deal with a particular subject and are divided further into several mini dialogues. The rest of the lesson deals with grammar, vocabulary, drills based on the sentences in the conversations, and finally exercises that have the student demonstrate proficiency for that lesson. There is also the benefit of contextual usage when teaching using conversations. By this I mean that by learning a language this way, the student can explicitly be shown context in grammar notes that would be otherwise difficult to understand. I think this method gives students a sense of accomplishment at the completion of each lesson. Another benefit of the material being broken into lessons is that you assuage the student’s guilt of not mastering the whole book in one sitting and thereby encourage further study. The reason the Matȟó Waúŋšila Thiwáhe series is so great is that it involves the living conversational language, it is engaging, there are dynamic interactions, it has dialogue with affect and prosody, with songs… and its fun. I hope that you can create Lakota language materials for adult learners based on dynamic conversations with multiple characters or voices, male and female, in the future. Let the students hear Lakota as a living language. Implicit memory, Let the Muscles of you Tongue Remember for You. Explicit memory is the recalling of facts, dates, and such. Implicit memory is when you remember how to do something, like riding a bike. Once you learn, you just know and do it. You then can focus on where you want to go and the surroundings. The heart of the FSI method is the dialogue but the way that content is memorized is via the drills. The drills use repetition and it takes the place of explicit memory learning, (although not completely)… the muscles of your tongue, mouth, and throat remember for you. This way language becomes reflexive. Grammatical notes can take a back seat to actual speaking and the student is able to use words and phrases in conversation. Helmholtz was right, thinking takes time, and when having a conversation we often don’t have time to think, we just want to say the right thing quickly. Híŋ! Here Douglas Hofstadter talks about the process of analogy making and language. It is well worth students and teachers of language to get a little background on what goes on behind the scenes of language. Our minds are built for conversation, for listening and learning from the conversations of others. The primary faculty for this learning is learning by analogy. For example, I heard a older sibling or cousin use the term, “Wichokaƞhiyaye kiƞháƞ” (at noon) in a sentence. By the context in which it was heard, I will now use it. So, we hear native speakers use a term or phrase that is unfamiliar to us and we learn the term and the context in which it was used. Then we make an analogy or when we think there is a similar situation, (analogous to the time we heard it used before), we start to use it. Exposure to conversations is the ancestral way of learning a language. The Barron’s Mastering Series follows this way. I think another benefit to FSI style drills is that they can reinforce proper pronunciation and intonation. The drills are at conversation speed, as if you are overhearing someone speaking, with the proper conversational intonations, proper prosody, and not in some strange classroom dialect. This way the student, through repetition and careful listening can mimic this pronunciation and it becomes part of the implicit memory as well. As a result, proper pronunciation and intonation come out automatically. Again I will say that if a student learns an incorrect sentence or pronunciation than it is worse than not studying at all because they have to unlearn and then relearn the correct version. If someone learned wrong information and commits it to explicit memory, it is worse still. Note: The Barron’s Mastering Series is available with audio in Spanish, German, French, etc. for discount prices on Amazon. These are a great template for creating native lessons. FSI is the United States Federal Government’s primary training institution for employees of the U.S. foreign affairs community, preparing American diplomats as well as other professionals to advance U.S. foreign affairs interests overseas and in Washington. 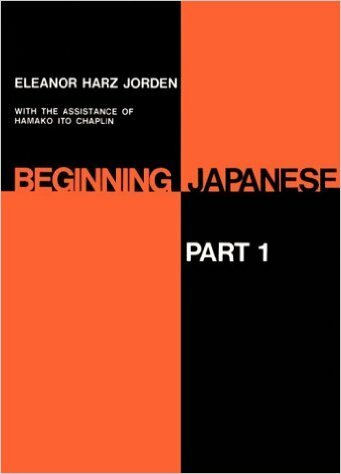 One very special FSI language course is Beginning Japanese by Eleanor Harz Jorden, one of the most challenging languages. The origins of this program began during World War Two. The FSI method was used for 70 foreign language courses at the height of the Cold War. You can benefit from the millions of dollars of research and effort that went into creating such an effective method for second-language acquisition. However, the original FSI method involved doing drills in the target language for eight hours a day. Much later, Barron’s Mastering Series adapted the techniques of the FSI program for commercial use by shortening and simplifying the content. Thank God! There are numerous second and third generation FSI style foreign language books in use today. Beginner’s Korean is a great second generation FSI course based on model conversations, (with 2 CDs in Korean only). Many other languages available. Beginner’s Korean follows the FSI presentation method. Introduction to pronunciation, basic reading of characters, greetings. Followed by lessons with model conversations, (with very usable phrases) in Korean only, English translation on a following page, play by play grammar notes and vocabulary on conversation dialogue, expansion of dialogue, and exercises. It is important for language teachers to create lessons that fit the Flow set point of their audience. Basically, FSI is over-learning to obtain automatic, reflexive control over a language with graduated difficulty. The usefulness of this to students of language can’t be over emphasized. It makes learning the most difficult language possible. One important point is that this volume is only concerned with only spoken Japanese. This volume uses a phonetic representation of Japanese using English letters and there are more advanced volumes that use the writing system. I suggest that for Lakota, an introduction to the writing system is fine, then emphasizing the spoken aspect so the student can become fluent. After the student has basic command of the spoken language and grammar, the writing can be emphasized more. After the introduction, this textbook an introduction to pronunciation and pronunciation drills. Which can be seen here: Beginning Japanese. Then the lessons begin. I have prepared the first lesson from this book with audio. Of course I am not asking that someone learn Japanese but rather that you can benefit from the principles of this highly structured and efficient lesson presentation that uses minimal English in teaching. shorter versions that the original FSI lessons, they can be easily shortened further to accommodate the target audience and still be effective. Please review the Introduction and Lesson 1 with audio. Text is here: Japanese.pdf. (I suggest printing this pdf for review with audio). Here I have laid out some Lakota drills in the FSI style. This is assuming that there would model conversations and grammatical notes on which these drills are based on. Minimal English is used, maximum Lakota is used. Mind you these drills are for the first lesson but right off the bat they dive into the language. Hóka hé! Bold-faced words in the substitution drill ‘A’ will be used to signal the changed word to the student who is to utter the correct sentence in Lakota (at conversation speed with proper intonation) before the speaker on the tape says the answer phrase. Note, the pause time in the audio between when the tutor first speaks and the answer. This pause allows the student time to say the correct phrase. However, if the student fails, the correct phrase is said by the tutor, reinforcing the student’s knowledge. Please pardon my poor Lakota pronunciation. My intent here is not to teach Lakota but to demonstrate the FSI text and audio presentation techniques… specifically the strategic building up the students ability, planned pauses, and minimal use of English. Can you answer before the answer comes? Try it first while reading the text below. Next, try giving the answers before the voice on the audio does without looking at the text. 1. Teacher says the model sentence, the student repeats it. 2. The teacher says the new word to create the next sentence. 3. The student says the new sentence with the new word. 4. The teacher give the correct sentence and then the next new word. 1. That horse (over there) is white. Šúŋkawakȟáŋ kiŋ ká ská. 2. That horse (over there) is grey. Šúŋkawakȟáŋ kiŋ ká ȟóte. 3. That bird (over there) is grey. Ziŋtkála kiŋ ká ȟóte. 4. That bird (over there) is brown. Ziŋtkála kiŋ ká ǧí. 5. That bear (over there) is brown. Matȟó kiŋ ká ǧí. 6. That bear (over there) is black. Matȟó kiŋ ká sápe. 1. Šúŋkawakȟáŋ kiŋ ȟóta he? /No/ Hiyá, šúŋkawakȟáŋ kiŋ ȟóte šni. 2. Šúŋkawakȟáŋ kiŋ ǧí he? /Yes/ Haŋ, šúŋkawakȟáŋ kiŋ ǧí. 3. Matȟó kiŋ sápa he? /No/ Hiyá, matȟó kiŋ sápe šni. 4. Šunǧíla kiŋ šá he? /Yes/ Haŋ, šunǧíla kiŋ šá. 5. Kimímela kiŋ ská he? /No/ Hiyá, kimímela kiŋ ská šni. 6. Šuŋmánitu kiŋ tȟáŋka he? /No/ Hiyá, šuŋmánitu kiŋ tȟáŋka šni. 7. Zičá kiŋ čík’ala he? /Yes/ Haŋ, zičá kiŋ čík’ala. 8. Pispíza kiŋ zí he? /Yes/ Haŋ, pispíza kiŋ zí. 1. What is this? Lé táku he? 2. What is that (near you)? Hé táku he? 3. What is that (away from us)? Ká táku he? 4. What are these (two things)? Lenáuŋs táku he? 5. What are those (two things near you)? Henáuŋs táku he? 6. What are those (two things over there)? Kanáuŋs táku he? 7. What are these (things-more than two)? Lená táku he? 8. What are those (things-more than two near you)? Hená táku he? 9. What are those (things-more than two over there)? Kaná táku he? D. Response Drill (In a more advanced lesson). 2. Tókheškhe Lakȟótiya ‘cat’ eyápi he? Lakȟótiya ‘igmú’ eyápi. 3. Tókheškhe Lakȟótiya ‘bear’ eyápi he? Lakȟótiya ‘matȟó’ eyápi. 4. Tókheškhe Lakȟótiya ‘bird’ eyápi he? Lakȟótiya ‘ziŋtkála’ eyápi. 5. Tókheškhe Lakȟótiya ‘house’ eyápi he? Lakȟótiya ‘thípi’ eyápi. 6. Tókheškhe Lakȟótiya ‘man’ eyápi he? Lakȟótiya ‘wičháša’ eyápi. 7. Tókheškhe Lakȟótiya ‘woman’ eyápi he? Lakȟótiya ‘wíŋyaŋ’ eyápi. 8. Tókheškhe Lakȟótiya ‘star’ eyápi he? Lakȟótiya ‘wičháȟpi’ eyápi. I am much grateful Wóphila tȟaŋka héčha. I am very much grateful Líla wóphila tȟaŋka héčha. 2. Shake your hands Napéčhiyuzape. Shake your hands Napéčhiyuzape ló. I shake your hands with a happy heart Čhaŋtéwašteya napéčhiyuzape ló. with a happy heart. napéčhiyuzape ló. 3. To see you Waŋčhíyaŋke. To see you Waŋčhíyaŋke ló. I am happy to see you Iyúškiŋyaŋ waŋčhíyaŋke ló. I am happy to see you too. Míš-eyá iyúškiŋyaŋ waŋčhíyaŋke ló. Notice how on the audio portion the lesson is designed to encourage the student to speak on their own? Teachers should not overwhelm the students, but should allow students to easily attain mastery over a subject by breaking down lessons into easy to learn parts. One was to do this is to have students learn one sentence and once they can say it smoothly, change one word in the sentence. Also, this can be done easily, for example by backward chaining as above. Otherwise students will say of themselves, Taŋyáŋ ečhámuŋ šni kiŋ naháŋȟčiŋ óthaŋiŋ. (It’s obvious that I am not doing well yet). By adapting lessons to the students skill level teachers are saying, “Waslólyaya čha slol’úŋyaŋpi” (we know you are smart). Also, the expansion drill makes a long sentence easy to say. For more advanced drills, the student can be asked to insert multiple words into various sentences for substitution drills. Students can be asked to transform tense, politeness level, answer questions, pluralize a singular sentence, negate a sentence, and other things in transformation drills. Most aspects of conversation can be practiced this way. The basic idea is to reinforce a dialogue, with grammatical notes, with vocabulary, and with repetitive speaking exercises. Thereby, you commit the language to implicit memory and it becomes a new habit of the student. If they complete the lessons, they will not forget them. They will dream in Lakota. learn a few useful phrases. 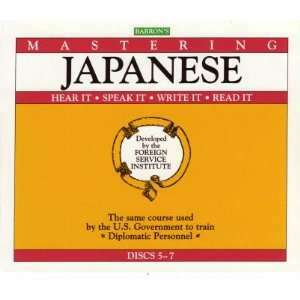 There have been many interesting phrasebooks I have read, like the Lonely Planet series. However, one stands out because of its popularity. The ‘Making Out In’ language series is a great introduction to foreign languages. Available for many languages including Spanish. I will warn you, it does have an adult chapter. Aside from this, it is very well done and is very popular. This is because it provides instant conversational ability, albeit limbic. It also acts as a quick reference guide during conversation for what you want to say to someone, target language/English translation. I think this book has prompted more people to move on to serious study of foreign languages than any other book. With useful conversational entries like, “Don’t!” “Give me some!” and the ever useful, “I don’t know.” I am not recommending a Making Out in Lakota, but I think you could use this as reference material to create a phrasebook that would attract many new students. Another advantage to this type of useful phrase book is what I call pot shot language usage. A sort of guerrilla warfare of language. When people are speaking English just drop in some Lakota out of the blue. So for example they say, “When is Sally going to dance?” you reply, Ektáwapȟaya kiƞháƞ wačhí kte lo. (She will dance later today). You can just skip English and start speaking Lakota. Human beings are generational, every new generation wants to exert itself and put its stamp on the world. Language is no exception. Merriam-Webster has it right when they added many words that young people use to their English dictionary, Merriam-Webster Dictionary adds 1,700 new entries. Young speakers of Lakota will probably come up with some unique Lakota words and innovations for texting, people should take notice. A useful and interesting lecture on language by Dr. Robert Sapolsky of Stanford. According to Dr. Sapolsky, our lateralized brain is hardwired for statistical learning, infinite production of language from finite terms with prosody, and comprehension of other people’s language production and emotions. Infants can recognize what is signal and what is noise, what is language and what is not. By hearing a language for several years, children can learn to predict what should be said next in that language, how to construct a new sentence, and how to answer a question correctly… this is statistical learning for language. The FSI program in essence mimics this statistical learning, production, and comprehension with prosody, almost… Nothing is better for language acquisition than growing up hearing it. In one of his books, Dr. Sapolsky mentions that humans can belong to multiple groups at once, and have a different status in each group. For example, someone may have job with a low level position. However, when they coach basketball they are an expert and on top of the world. In the same way, someone may not be good at math but be a master of Lakota and derive great satisfaction from it. Looking Closely at Other Success Stories. I read about some Native language success stories like Nahuatl, Cree, Navajo, and the revitalization of the Zuni language. There must be reasons behind their success and I wonder if their methods could be applied to the Lakota language? Watching the 1491’s and Tonia Hall I can’t help laughing. At the same time, I realized that for at least part of the time they were speaking Lakota. On that note, Mathó Waúŋšila Thiwáhe (Lakota Bears) is a great resource too, it is entertaining and teaching you Lakota at the same time. I think the more Lakota programming and content there is the better for the language. As for adult learners, can you imagine a Lakota language only soap opera or love story? A Lakota only cooking show with high production value? How about a Lakota Immersion village? The U.S. government set up immersion villages for advanced FSI students to practice their target language. Wouldn’t it be great if there was a temporary Lakota immersion village where students could practice using Lakota, hearing Lakota, and seeing Lakota? Here is some great Lakota language content from a major motion picture, Šuŋgmánitu Tháŋka Ób Wačhí. After studying your course I can understand a lot of this dialogue in this movie without subtitles. Of course some of the actors are not Lakota, (Omaha for example) therefore their pronunciation is closer to the Dakota dialect. This scene is a great example of the traditional way children learn a language, by hearing other people have conversations. Did you notice the little kid? It is important to save the Lakota language but we can have fun doing it. Human beings like to be in control, have predictability… most of the time. Transient loss of control, and transient difficulty is the spice of life. As the student is learning, having unexpected surprises or challenges around each corner stimulates them and keep them going. However, with overwhelming difficulty or continuous challenges students will hit a wall, get frustrated, and give up. Also, I think it would help students if you add some cultural notes, add some Lakota short stories for listening comprehension (a paragraph or two), and how about a song, a Lakota lullaby? Most importantly, provide content that references the words and grammar that the student has learned previously and thereby make learning Lakota seem easy. Why are there so many non-native speakers of English? I would say its economics. People’s own self interest, their livelihood is dependent on English. I think to increase the number of Lakota speakers a lot, a few things need to happen. Obviously there needs to be a connection between jobs and Lakota. I heard from a Canadian friend that the Cree Nation has gained official status for the language. Therefore, a interpreter must be provided by and paid for by the state if requested, (e.g. in hospitals or in courts). Another possibility is connected to tourism. The Lakota culture has a lot of clout with tourists, American and foreign alike. I wonder if a traditional Lakota village with Lakota speaking actors would work? A Lakota play with an English interpreter? Or how about teaching Lakota at a Lakota language and culture camp. Native and non-native kids could learn basic Lakota and some Lakota culture, e.g. handgames. I’m sure if the number of speakers starts increasing, businesses connected to the Lakota language would increase and even more people would be interested in learning the language. Another idea is to promote the language publicly. One idea is bilingual signage. I would like to see Lakota language signage in Rapid City, among other places. Just seeing Lakota signage gives exposure the language, exposure can prime people to learn more, (think corporate logos and how they influence our lives by constant exposure). 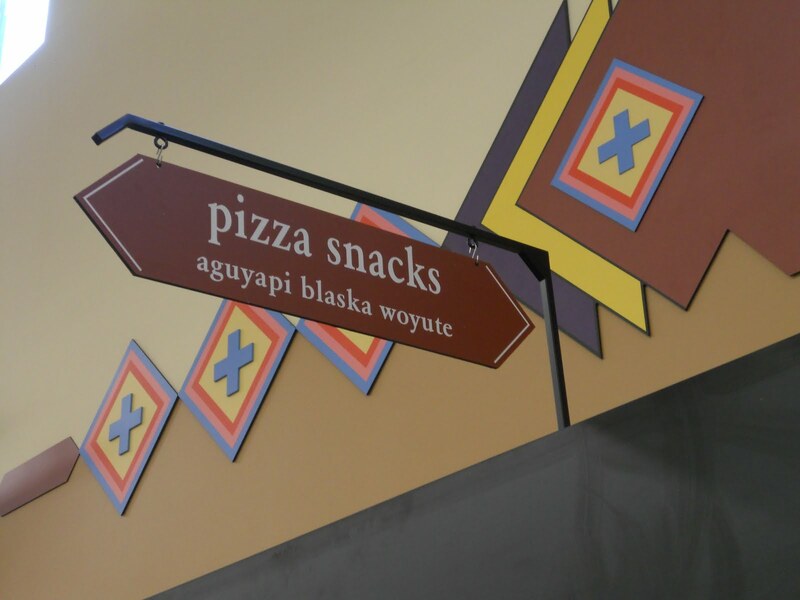 Lakota signage in the Turtle Creek Supermarket on the Rosebud reservation. Imagine a Lakota themed restaurant with a bilingual menu. A coffee shop that is called Wakhálapi in Rapid City? I think it is a great idea and would give the language some exposure, it would bring some culture, it would add local flavor, it would attract tourists, and it would make quite a number of people very happy. Be proud of your language, tell the world! Use Lakota place names in your daily speech, Pȟežúta Ȟaká not Kyle, South Dakota. Repair the damage of the past with language. Represent! Road sign on the Stoney Nakoda First Nation Reserve in Canada. I hope you have found this blog interesting and helpful. I think the Lakota language has a bright future because of your efforts. From the evidence presented here it seems that children need to hear a language spoken around them daily to learn it and adults need extra help to gain fluency. The FSI program has been demonstrated to be the most effective teaching method. Teachers of adult Native languages courses should take note of what methods show the best results and utilize them. This continent is not Europe, never was, and never will be. I don’t think I can express all my feelings about the importance of Native Languages and culture very well, so I will let Graham Greene do it for me. Aŋpétu kiŋ lé taŋyáŋ máni yo. Artwork at top of page:”There’s One in Every Crowd,” by Dwayne Wilcox (Lakota). 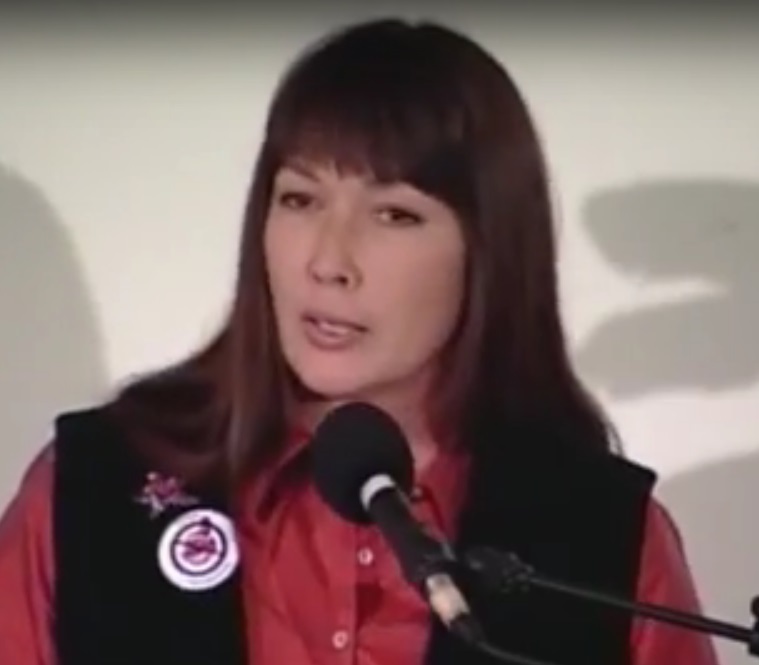 This entry was posted in Dakota language course, Dakota language instruction, Hidatsa language instruction, Lakota Language, Lakota language course, Lakota language instruction, Nakota language course, Nakota language instruction, Native American Languages and tagged american indian dropout rate, Assiniboine language, Assiniboine language course, Assiniboine language instruction, Îyârhe Nakoda, Îyârhe Nakoda course, Blackfoot language, Blackfoot language instruction, Crow language, Crow language course, Crow language instruction, Dakota language, Dakota language course, Dakota language instruction, Hidatsa language, Hidatsa language course, Hidatsa language instruction, Lakota Language, Lakota language course, Lakota language instruction, Mandan language, Mandan language course, Nakota language, Nakota language course, Nakota language instruction, Native American Languages, Navajo language course, Navajo language instruction, Nez Perce language, Nez Perce language course, Nez Perce language instruction, Niimiipuutímt, Niimiipuutímt course, Niimiipuutímt instruction, second-language acquisition, Stoney language, Stoney language course, Stoney language instruction. Bookmark the permalink. What is the name of the person who wrote this article? My name is Jesse Crafts. I have been learning Lakota for a couple years. I am hoping that actual Native language conversations will be used as a teaching tool.